The primary goal of responsible hobby breeders is the betterment of their favorite breed, not a monetary profit. These breeders are motivated by a sense of responsibility and dedication to the breed, to their dogs, and their puppies. The principles and practices of reputable breeding programs are associated with rewards, disappointments, and costly decisions. Reputable breeders are dedicated to their breed, and are often involved in at least one dog-related activity. These breeders are usually members of dog clubs. 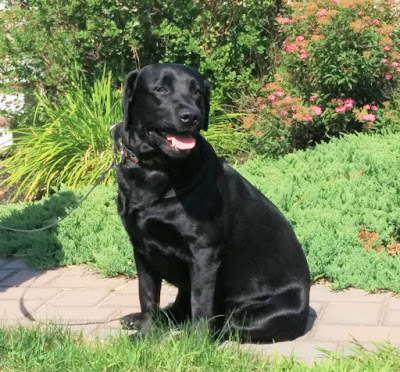 These breeders often show their dogs in conformation shows, work with them in obedience competition, participate in field trials, and/or volunteer with the local Labrador Retriever rescue organization. Responsible breeders will often serve as mentors for the novice breeder, sharing their knowledge, experiences, and insights with the new breeder. These breeders have goals in mind for each breeding. They usually plan a litter with the hope of keeping one of the puppies. The breeding pair is carefully selected based on the pedigree, temperament, conformation, soundness and working ability. Responsible breeders look for a sire that will complement the strengths of the females and help improve on any weakness. The sire and dam will have at the recommended health clearances for Labradors. Responsible breeders usually plan 1 to 3 litters a year. 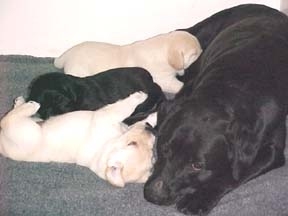 These breeders do not breed Labradors with disqualifications such as lack of nose pigment, a brindle coat, tan and tan marking, or dilute coat colors. Reputable hobby breeders place their puppies in home that have been screened. They often ask you about your family situation and how you plan to care for your puppy. Their puppies are usually placed with a contract that includes a health guarantee. These breeders will help the new owners with any problems for as long as you own the dog. Responsible breeders usually place their puppies with a spay/neuter agreement and AKC limited registration. Reputable breeders utilize the AKC limited registration option to maintain the integrity of their breeding program and to the quality of the breed. The Labradors used in their breeding programs should be carefully selected. These breeders aware of the risks and responsibilities. These breeders want to take back the dog if the new owners are unable to keep the dog for any reason. Unexpected situations arise, and you may not be able to keep your dog. Reputable breeders will take the dog back or assist you in finding a loving home for the dog. Commercial breeders lack the dedication to the breed that is an essential characteristic of responsible, ethical breeders. Their priority is a financial profit. High-volume Commercial Breeders are often referred to a puppy mills. Their focus is on quantity, not quality. These breeders often own numerous different breeds. The sires, dams, and puppies probably do not receive proper care. Often, their dog and the puppies are raised in crowded unsatisfactory conditions. These breeders do not consider the temperament, conformation, or soundness of their breeding stock. The breeding females usually have multiple litters. The puppies are poorly socialized and some may have health problems. These breeders sell their puppies to puppy brokers for resale in pet stores. Most small-volume commercial breeders that utilize basic animal husbandry practices are also motivated by financial profits. Generally, they are not concerned about the best interest of the breed. Their breeding dogs usually do not have the recommended health clearances. However, some of them may consider both quantity and quality. The conditions their dogs and the puppies live in are variable. Generally, these breeders keep their dogs and puppies with a better environment than the puppy mills provide. Typically, these breeders have numerous females of breeding age. They may own several different breeds. For convenience and to avoid paying stud fees, they usually own stud dogs. Some small scale commercial breeders provide basic care and satisfactory living conditions for their dogs and their puppies. Some of these breeders may start with nice dogs and good intentions, but producing good quality puppies requires much more than the mating of 2 purebred dogs! Due to lack of knowledge and/or the desire to make a profit, the quality of the puppies from these breeding programs usually decreases with every generation. There are small-scale commercial breeders that obtain the recommended health clearances on the sire and dam, maintain clean kennels, and provide the dogs and their puppies with appropriate living conditions. These breeders produce above average quality puppies that are well socialized. They make a financial profit and provide their dogs and puppies with proper care in a healthy environment. Amateur or backyard breeders may have good intentions, but they usually lack the knowledge, experience and dedication to the breed to make appropriate decisions. These breeders produce puppies for a variety of reasons. Some want to make a little extra money. Others want the children to "experience the miracle of life". Some think that breeding their female dog will calm her down. It doesn't. Their puppies may not be raised in a suitable environment, and the quality of the puppies is variable. Backyard breeders are usually unaware of the AKC standard for their breed. They know very little about pedigrees or how to select an appropriate mate for their dog. Most likely, the selection of the stud dog is based on the stud fee and geographic convenience. Some amateur breeders may own both males and the females. Usually, these breeders do not obtain health clearances prior to breeding their dogs.